Hello! Hey, it's Thursday! Who is stealing the weeks? Ok, I guess I can forgive this week for flying in as I was on holiday at the start. But since being back at work it just feels like a blur! I'm not complaining though, I've had enough time to do a wee bit of colouring and prep for some DT work. And I won a challenge over at Fresh Brewed Designs (check the link on the left handside) for my Especially For You card. And.. I got some time to play with my new watercolours!! 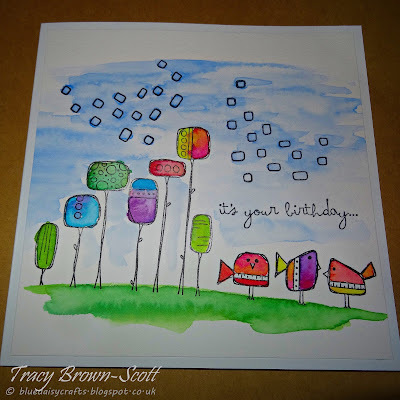 What better to try them out on than the fabulous Kim Dellow stamps from PaperArtsy! So here is my first attempt.. a simple "one layer" card. I just love the little birds!! I have to say that these Kuretake watercolours are so easy to work with!! I'm going to enter this card in the following challenges..
Hi Tracy, your card is fabulous and I truly love the whole visual of it. Your watercolor is super nice (glad you liked the brand since I was thinking get some myself) and the stamps you use are adorable. Anyhow, I come from Cre8tive Hands Friends blog to thank you for taking the time to join us in our "Anything Goes Challenges", We appreciate it very much. Beautiful card the image is simply striking. Thanks for joining in on the fun at Aud Sentiment Challenge. We look forward to seeing you again. Those little birds look wonderful. Love the watercolour look. Thanks for sharing with us at Aud Sentiments challenge this fortnight. I have not try with watercolor as well, guess will find some time to test out my water color which just arrive this week! Your card is great, love the birdie and the colour combination.